Measurements: 2.75 x 4.73 inches, or 69 x 120 mm. Back of card: Looks like an ornate, gold-encrusted book cover. In the center, an oval with an ornate equal-armed cross in it. Bands across the top & bottom give the name of the deck, "Sacred Art Tarot". May be inverted, but the author expressly says he does not want his deck inverted. Publisher: US Games Inc. Printed in Italy. Comments: Do not adjust your monitors. The reproductions in this deck are not first-rate. Given that printing standards in tarot, as well as the standards for fine art prints, are both quite high, this was both surprising and disappointing. 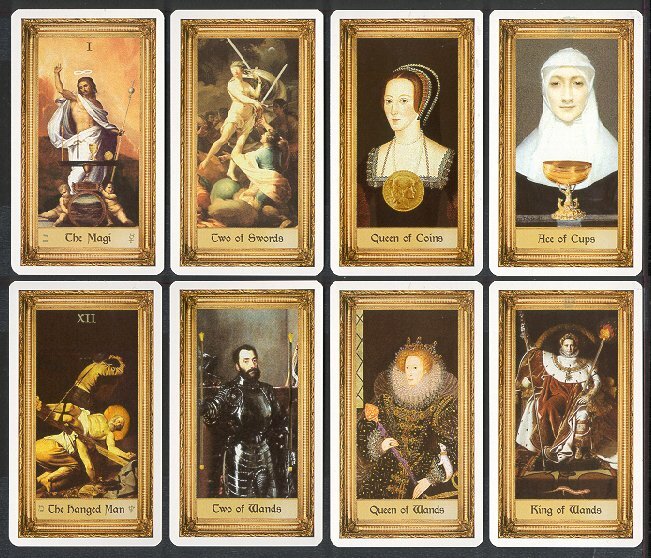 It's not a deck of religious art so much as it's a deck of European fine art which includes many Christian images. There are three cards shown on the outside of the box, and inside, when you unwrap it & get to the deck itself, another two cards. All sacred. Queen Elizabeth I & Napoleon, among many others, are not. I have problems with decks like this, since I read the cards literally. Is it a Hanged Man, or is it Pope Peter being crucified upside down? Should I interpret this card as serenity under duress, or ritualistic execution? Death was never part of the Hanged Man before. I don't think it should be, but, on the other hand, what other sacred symbol will show us someone slung upside down? Regardless of circumstance? Should circumstance, what we bring to the cards (ie, that we know who the Hanged Man is), be part of our interpretation? But then, is not what we ourselves bring to the cards the essence of reading them? So what is Peter, the failed Apostle, the failed leader (overshadowed by Paul, the outsider brought in to rescue an otherwise failed operation) doing on this card as the Hanged Man? Does the interpretation not become, The timid Clown gets his due - ? Reverse meanings of the cards are not added, because I prefer not to use the Sacred Art Tarot upside down - Andre St. Dryden, Sacred Art booklet, pg. 8. But let's be brave & flip the Hanged Man anyway. It then becomes, The Coward escapes his fate. Tarot is nowhere more powerful than this, when we bring ourselves to the cards & rewrite them according to our own experiences & beliefs. I happen to have a wry view of the early Christians. If I knew more about Napoleon, I'd probably have a wry view of him, too. What does St. Dryden say of the Hanged Man? "Limbo" is a hoot. Peter sacrifices his life in memory of his Savior & for his troubles he goes not to Heaven, but to the celestial Home for Unwashed Babies. Is St. Dryden giving us his sly opinion of St. Peter? Maybe that's the key to this deck: A battle of Saint against Saint. May the best Saint win! US Games used to give us better decks.